Specs & More - Star Drive Wood Screws - Screw Products, Inc.Star Drive Wood Screws – Screw Products, Inc. 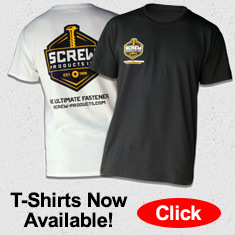 Here at Screw Products, Inc. we provide the most useful, reliable, and quality fasteners in the world today. The chart available for download below is from 3rd Party Independent ISO Certified Labs. For more information on these tests, or a copy of the complete report, please call us Toll Free at (877) 844-8880 today.